*This product in the movie differ from the real products by filming conditions, etc. 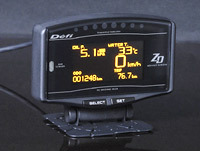 Defi-Link ADVANCE Control Unit is necessary to operate ADVANCE CR gauges. This product does not contain sensors or sensor wires. Purchase necessary sensor sets additionally. If you already have ADVANCE CR or ADVANCE BF gauges, you don’t need to purchase the sensor and sensor wire additionally.